A visa allows you to enter Thailand for a specific length of time depending upon the type of visa. The passport or travel document will show the date of your entry and how long you are permitted to stay in the country. In Thailand there are eight major visa types issued under the Immigration Act. Each category is restricted to the purpose for which the visa has been issued, and foreigners are required to strictly follow the rules governing each visa category. Change of address or status should be relayed to local police within 24 hours. Transit Visa “TS”- Applicable to foreigners entering Thailand with an intention to travel on to another country. Tourist Visa “TR”- Applicable to foreigners visiting Thailand for sight-seeing purposes only. “B” is for business purposes. “BA” is for business or investment. “IB” is for investment purposes or other affairs connected with an investment under the law governing investment promotion. This is a category of visa with issuance controlled by the Board of Investment. “IM” is for investment purposes, as approved by the appropriate ministries or departments concerned. “ED” is for purposes of study or observation. “RS” is for purposes of scientific research or teaching in a research or educational institution in Thailand with approval from the ministry or department concerned. “M” is for performance of duties connected with the mass media. “R” is for missionary work with approval from the ministry or department concerned. “EX” is for performance of skilled or expert work. “O” is for other purposes as prescribed in the ministerial regulations (as dependents, retired persons, or sports trainers; for family reunions, medical treatment, or legal proceedings). Diplomatic Visa “D”- Applicable to foreigners who enter the Kingdom on a diplomatic or consular mission or for the performance of duties with international organizations. Official Visa “F”- For foreigners who will perform official duties involving the Thai government. Immigrant Visa (Permanent Residence)- Applicable to those foreigners entering Thailand for permanent residence purposes. Non-Quota Immigrant Visa- Applicable to permanent residents wishing to leave Thailand and return within a year. Courtesy Visa – applicable to those diplomatic and/or official passport holders who enter the Kingdom for purposes other than official duties and to those ordinary passport holders who enter the Kingdom in response to an official Thai request. How long is the allowed length of stay for each visa type? The length of stay in Thailand depends on the type of visa granted. For Transit Visa, allowed stay must not exceed 30 days. For Tourist Visa, allowed stay must not exceed 30 or 60 days. For Non-Immigrant Visa, allowed stay must not exceed 90 days. Diplomatic, Official, and Courtesy Visas are allowed to stay in Thailand as deemed necessary. Would an extension of stay be possible? A transit visa may be extended for 7 to 10 days depending on your nationality. Meanwhile, a tourist visa may be extended for a maximum of 7 days or 60 days (30 days at a time) depending on your nationality as well. Such extensions require a government fee of Baht 1,900 for processing. Non-immigrant visa categories B or B-A are usually extended for a period not exceeding 1 year at a time from the date of arrival except IM which shall not exceed 2 years, and IB which is generally 2?3 years depending on the recommendation of the BOI and the size of the investment. Extensions for non-immigrant visas require a government fee of Baht 1,900 as well as the submission of supporting corporate documents. Upon arrival in Thailand, the length of stay you are allowed will be stamped on your passport. Passport and visa control is a rigorous process in Thailand and violators are penalized. If you overstay, you will have to pay a fine of Baht 500 for each day after the expiration date of the permitted length of stay up to a maximum of Baht 20,000. This fine may be paid at the Immigration Division or at the airport upon your departure. If you cannot pay the fine for overstaying, you will be detained at the Immigration Detention Center. If you are already in Thailand on a Tourist Visa, you may apply for a non-Immigrant visa if need to stay in Thailand longer. This procedure may be done within the country. But you must apply for a change in type of visa in not less than 29 days before the current visa is due to expire, but various supporting documents are required to be submitted. 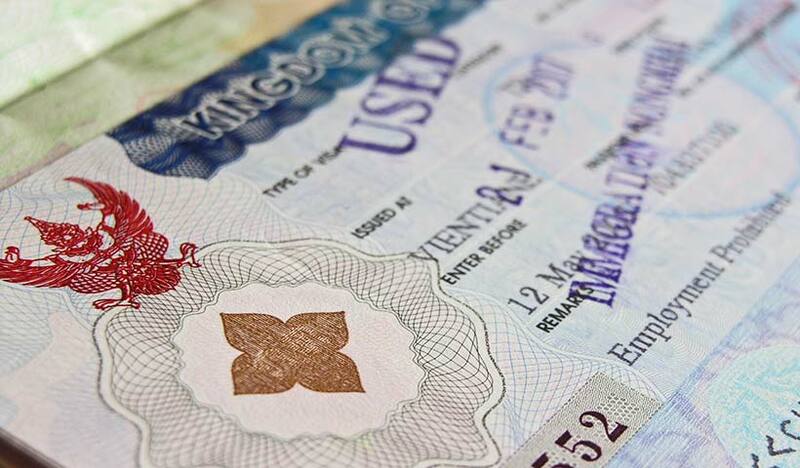 Foreigners who wish to leave Thailand but return to the country by the expiry date of such visa without having to apply for a new visa must apply for a re-entry permit prior to departure. A re-entry permit allows you to re-enter Thailand and use the time remaining on his/her visa. If a re-entry permit is not applied for, the visa will automatically be canceled although it has not expired. Apart from Immigration offices throughout Thailand, a re-entry permit may be obtained at Suvarnabhumi (Bangkok), Chiang Mai, Phuket, Hat Yai, and Sukhothai international airports, as well as other designated immigration checkpoints throughout the country. Suvarnabhumi (Bangkok) International Airport operates 24 hours, 7 days a week, while other checkpoints operate from 8 AM to 4 PM, Monday to Friday. The fee for a single re-entry is Baht 1,000 while that for multiple re-entries is Baht 3,800. It is better to request a multiple-entry visa if you will be frequently traveling out of Thailand. If you leave Thailand before your visa has expired and want to return but does not have a re-entry permit, you must apply for a new visa from a Thai Embassy or Consulate abroad. Exits may only be legally made at designated immigration control points. Crossing of borders is considered an exit for immigration purposes, whether or not the exit point is controlled, and returning to Thailand from such trips is a new entry requiring proper visas or re-entry permits.